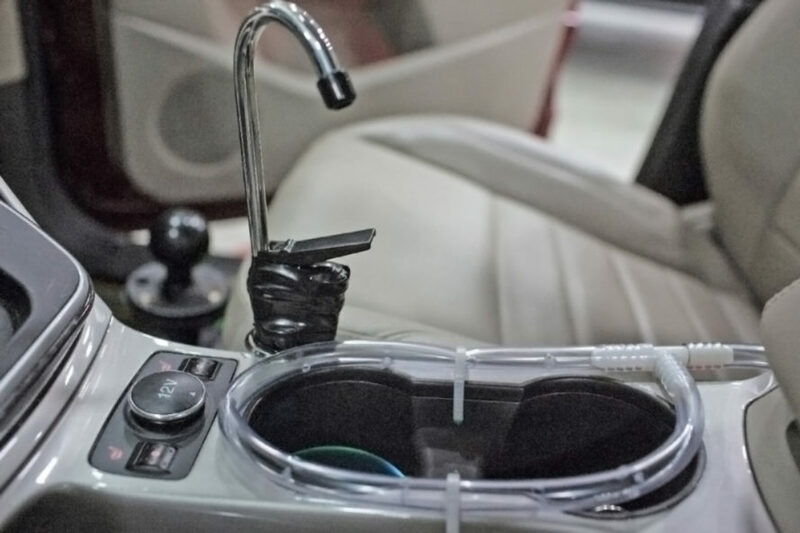 What if accessing fresh water on the go was as easy as turning a dispenser in the front of your car? That was the vision Ford engineer Doug Martin laid out in this week’s Further With Ford trend conference in Detroit, Michigan. Inspired by a water-dispensing billboard in Lima, Peru, Martin wanted to create a system that would recycle the condensation produced by vehicle air conditioning to produce clear, drinkable water. Martin unveiled his prototype on Monday, a system called “On-The-Go H2O.” Using a simple kitchen pan (helpfully provided by his wife), Martin collected the droplets of water that would normally fall to the pavement below the car as the air conditioner removes humidity. The water in the pan is then pumped through a filtration system to get rid of any contaminants. Then, it’s stored in a tank inside the car, ready to be dispensed from a faucet between the driver and passenger seats. With the air conditioner running, Martin found his invention could produce more than 64 ounces of water per hour. That’s the equivalent of nearly four average-sized water bottles: not an insignificant amount. The new invention could help provide water in remote locations, as well as reduce plastic waste by making water bottles unnecessary. The technology is still in the prototype phase, so it’s unclear when we’ll actually see it in action inside Ford vehicles. Martin hopes that this technology could be repurposed to help provide access to clean drinking water in regions where it would normally be scarce. This isn’t Martin’s first invention at Ford. The engineer has been with the company for 22 years, and in that time he’s managed to amass around 70 auto-related patents. If this car really makes it into the industry, it would definitely be a breakthrough in the new innovation sector. Not only will the emission levels be reduced, but water can also be harvested and produced at the same time. This new car technology can help to further contribute toward environmental efforts which will eventually help mankind as a whole. The car of the future will be powered by water and not need hydrogen or fossil fuel. The top of the car will be covered with catalyst like rust that can split water into hydrogen and oxygen. These gases will be the feed for a hydrogen fuel cell. With the air conditioner running, Martin found his invention could produce more than 64 ounces of water per hour. That’s the equivalent of nearly four average-sized water bottles: not an insignificant amount. The new invention could help provide water in remote locations, as well as reduce plastic waste by making water bottles unnecessary. The technology is still in the prototype phase, so it's unclear when we'll actually see it in action inside Ford vehicles.